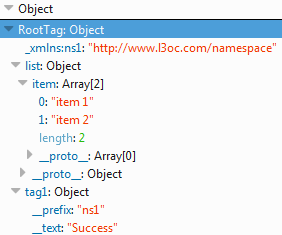 Pay attention to the "__text" attribute, it contains the tags content, so to get it, you need access the parameter name like "RootTag.tag1.__text" to get the 'Success' text from the tag1. Well, that's all ! The library has no dependencies, supports JSON to XML conversion and has a lot of others features too, check them out!